The 2014 Sochi Olympics may be over, but the girl power party has just begun. Sure, there are still a fair amount of sports in the Olympics where women aren’t allowed to compete (sounds utterly ridiculous, but sadly it is true) but we have more reason to celebrate than moan, because there are huge barriers being broken down. Just look at how Lindsey Van and the rest of the women’s ski jumping team fought to finally compete in the Olympics this year after an epic 5-year battle with the International Olympic Committee. 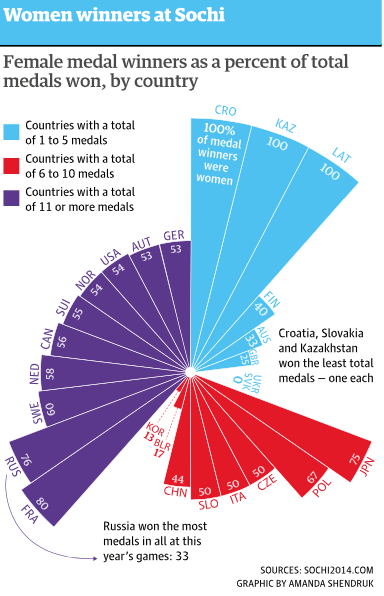 And now that the games have wrapped up, the Guardian created this awesome infographic showing how women dominated the medal count in most countries over men. Yes! 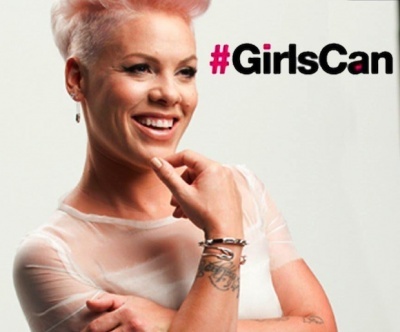 Following on from the games, Covergirl just released this empowering new campaign which tied in nicely with the efforts of many of the women who are breaking down barriers, called ‘Girls Can’. It features the current roster of celebrity Covergirls including Katy Perry, Pink, Ellen Degeneres, Sofia Vergara, Janelle Monae and Queen Latifa. We also see teen rapper Becky G and a female ice hockey player from team USA. The video starts with all the celebs reiterating all the things they were told they can’t do such as own their own business, be strong, rock, rap, play the leading role, be a comedian etc. But all these women have been carefully selected to show girls that in fact women CAN do all of these things. Aside from the video, which debuted during the broadcast of the Sochi Olympics closing ceremony, there is also an added media element to this empowerment campaign. Covergirl announced on Feb 24th a partnership with CNN’s Soledad O’Brien and her company Starfish Media Group, which is dedicated to producing empowering stories through issues of race, class, wealth, opportunity, poverty and personal stories. O’Brien will host a series that explores many of the biggest challenges facing young women today. When a young woman pursues dreams of higher education, or success in business, achieving those dreams are often fraught with obstacles. O’Brien’s series will follow the lives of several young women through their personal challenges and share how each young woman has overcome specific issues with the assistance of O’Brien and her partner Brad Raymond’s Starfish Foundation. This campaign isn’t just designed to be a feel-good girl power party, but it is here to start an open dialogue with women everywhere. What are your dreams and goals in life and what kind of barriers or naysayers have you come up against along the way? The celebrities featured in the video are a great example of showing women who didn’t just follow traditional trends in the entertainment industry, but proved that it is possible to create your own unique path even when everyone says you can’t. Like we said at the start, we may have a long way to go to reach 100% equality on all fronts, but we are making great progress. The more we openly discuss these issues, support each other and elevate better female representatives in various industries, the more barriers will be broken down. If only more beauty companies would join the ranks of Dove and Covergirl in empowering a generation of their loyal consumers, rather than making them fee unworthy without their products. We hope this marketing trend will continue to influence brands as well as women. Pingback: Janelle Monae: "Come In Peace, But Mean Business"